Wedding gowns, christening robes, Quinceañera dresses, and pageant gowns can last for many years if properly cleaned and preserved. Max I. Walker offers several options for dress cleaning and gown preservation after the big day. Gown preservation is a very specialized process. Your valuable wedding or special occasion dress will be carefully evaluated, receiving individualized treatment based on the fabric type and stains, ensuring it remains as beautiful as the day you wore it, and can be passed on to future generations. Ordinary dry cleaning will not thoroughly remove all organic matter from garments. Sugar, alcohol and salt (from sweat) stains are very common on wedding gowns. These stains are nearly impossible to see when they are new. 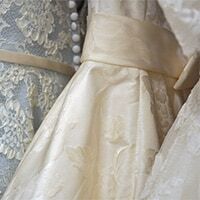 But as they break down over the years, these "invisible" stains will begin to turn the fabric of the gown yellow or brown. A specialized cleaning process is necessary to remove these types of stains, ensuring the gown will remain in its current pristine condition. Your thoroughly cleaned gown is carefully folded in acid-free paper, to prevent permanent creasing and damage or discoloration. The folded gown is then placed into a sealed clear vinyl bag to protect from contaminants like moisture or insects. The oxygen is removed from the sealed bag, and replaced with an inert gas. This ensures the gown is not crushed, but also not exposed to damaging oxygen. The bag will be stored in a decorative outer box, protecting it from damaging UV light. Have some questions about this process? We're here to help. Call or stop by any Max I. Walker location, or email us at info@maxiwalker.com.